Humpback whales within a distinct population sing the same song, while the songs of whales from other populations are different. The humpback whale is a baleen whale, and one of the largest members of the rorqual family. Adult females average 49 ft (15m) in length and weigh approximately 35 tons, with adult males being slightly smaller. Rorquals can be distinguished by having both a dorsal fin and ventral pleats running from the tip of the lower jaw back to the belly area. 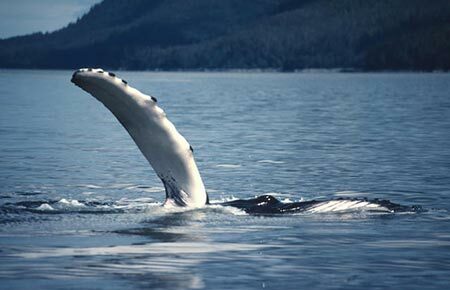 The humpback whale has a distinctive robust body shape that narrows to a slender peduncle. The head is broad and rounded when viewed from above, but slender in profile. The top of the head and the lower jaw contain a series of rounded fleshy knobs. Humpbacks are predominantly black, but have varying degrees of white on the throat, belly, flippers and flukes. Humpbacks can be distinguished from other whales by the extremely long flippers with large knobs on the leading edge. The flippers can reach 25 to 30 percent of the total length of the animal. The flukes are broad with sharp points and serrated edges. The shape and pattern of each whale’s dorsal fin and flukes are distinct and have been used by biologists to identify and monitor individual animals. Humpbacks are believed to live 40-50 years. Aging of adult whales has proven to be difficult and studies on aging techniques are ongoing. Females reach sexual maturity at 5 years and males at seven years. Humpback whales utilize a polygynous mating system, with males competing aggressively to mate with estrous females. Breeding season takes place during the winter months when individuals inhabit tropical waters. Females have an 11.5 month gestation period and give birth to a single calf every one to three years. Calves nurse for 6-10 months on milk that is 45-60% fat (human milk is 2% fat). At birth, calves average 10-15 ft (3-5m) in length and weigh about 1.5 tons. Filter Feeding Mechanism: Baleen whales take their name from the fringed plates called baleen which hang downward on either side of the upper jaw. Humpback whales have a series of 270-400 baleen plates that are dark in color and measure about 30 in (76cm) long. During feeding, large volumes of water and food can be taken into the mouth because the pleated grooves in their throat allow for a substantial amount of expansion. As the mouth closes, water is forced through the baleen plates, which act as a sieve, trapping the food inside the mouth. Bubble Net Feeding: They are also known for utilization of bubble nets, created by releasing air bubbles while swimming in circles beneath their prey, then lunging, open mouthed, to the surface through the center of the concentrated prey. Humpback whales rarely feed while migrating or during the winters in the tropical waters. Feeding occurs almost exclusively during the summer months and animals live off of fat reserves while breeding. During feeding, each humpback whale eats up to 1.5 tons of food per day that consists mainly of euphausiids (krill), and various small schooling fishes. Humpbacks are usually observed alone or in small groups that persist for only a few hours. Groups may stay together a little longer in summer in order to forage and feed cooperatively. Long-term relationships lasting months or even years, have been observed, but are rare. Humpbacks are renowned for their various acrobatic displays. One of the more spectacular behaviors is breaching, which researchers believe may be related to courtship or play. During mate selection, groups of 2-20 males can gather around a single female and exhibit a variety of behaviors in order to establish dominance. Breaching, spy-hopping, lob-tailing, tail-slapping, flipper-slapping, charging and parrying can be observed, and these displays can last for hours. Song is also assumed to have an important role in mate selection; however, scientists remain unsure whether the song is used between males in order to establish identity and dominance, between a male and a female as a mating call, or a mixture of the two. Humpback whale songs are long, complex, and only sung by males. Whales within a distinct population sing the same song; while the songs of whales from other populations are different. A typical song lasts from 10-20 minutes, is repeated for hours at a time, and changes gradually over the years. The humpback whale is a migratory species, spending its summers in temperate and subpolar waters, but mating and calving in tropical and sub-tropical waters closer to the equator. Humpbacks may be seen at any time of year in Alaska, but most animals winter in temperate or tropical waters near Mexico, Hawaii, and in the western Pacific near Japan. An exception to this rule is a population that remains year-round in the Arabian Sea. Migrations of up to 3,000 miles (4,800 km) each way are typical. In the spring, the animals migrate back to Alaska where food is abundant and tend to concentrate in several areas including Southeast Alaska, Prince William Sound, Kodiak, the Barren Islands at the mouth of Cook Inlet, and along the Aleutian Islands. 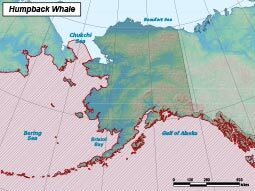 The Chukchi Sea is the northernmost area for humpbacks during their summer feeding, although, in 2007, humpbacks were seen in the Beaufort Sea east of Barrow, which would suggest a northward expansion of their feeding grounds. Throughout its range, the humpback whale has been listed as endangered under the Endangered Species Conservation Act of 1970, and as depleted under the Marine Mammal Protection Act of 1972. Worldwide, humpback numbers were severely reduced during commercial whaling; some evidence suggests 90-95% of the population was removed. There are three separate populations of humpbacks, those living in the North Pacific Ocean, those in the Central North Pacific Ocean, those in the North Atlantic Ocean, and those roving the oceans of the Southern Hemisphere. In the North Pacific, more than 23,000 animals were taken in the before this species was granted protection from whaling in 1966. Before whaling began, approximately 15,000 humpbacks are estimated to have existed in the north Pacific. Current population estimates for the North Pacific stock range from 20,000 individual animals, and 10,000 individuals in the Central North Pacific stock and an increase in numbers on the Hawaiian wintering grounds suggests that at least this portion of the North Pacific stock is growing by approximately 7% per year. The primary source of mortality for humpback whales is most likely humans. Historically, most whales were killed through commercial whaling. Currently, whaling is strictly regulated by the International Whaling Commission, with only small numbers being allowed to be taken for aboriginal subsistence purposes. Since commercial whaling was banned, most human caused humpback deaths are through entanglement in fishing gear, boat strikes, or acute exposure to pollutants. Secondary effects of humans on humpback whales such as pollutants, contaminants, decrease in prey species, and decrease or alteration in habitat are difficult to estimate. Predators of humpbacks include killer whales, false killer whales, and large sharks; there have been very few documented attacks by these predators on humpback whales, including calves. Euphausiids (krill), and various small schooling fishes. Females give birth to 1 offspring every 2-3 years.